Please note: Change of Show Title to “Alan Anderson : Whisky For Dafties”. The whisky tasting show with a difference, Six malt whiskies to be tasted, many laughs to be had. 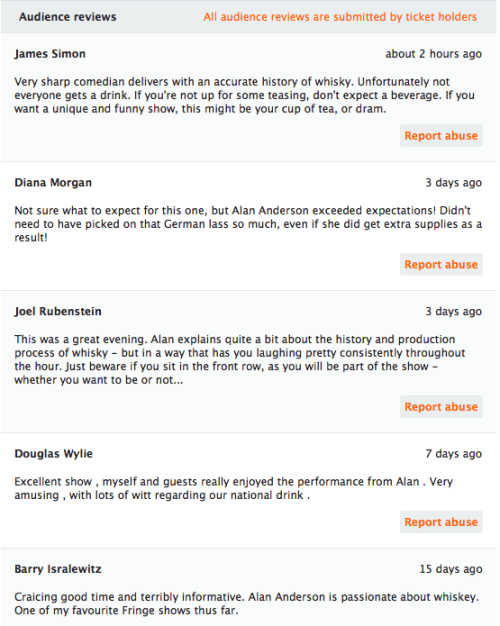 Alan Anderson has performed his unique whisky tasting comedy show across the globe to sell out audiences. You get to sample some fine malty, peaty beverages whilst Alan fills you in on the history, methodology and lore of this great drink. It’s a hilarious hour of educational drinking. Wine tasting is fir poofters. This is the real (15 year old single malt cask aged) Mcoy. Ha’e a dram, some cheeky banter and learn about Scotland’s greatest exports with Scotland’s most in-demand compere. ‘Creative, fun, lighthearted way to learn about whisky’ (The Scotsman). ‘Mercifully, Anderson isn’t just some Scotsman who want to get drunk with you, he’s a passionate whisky enthusiast who absolutely needs his audience to learn about the magical amber liquid. ‘The festival program blurb gives the impression of a storytelling show about debauched drunken behaviour, but the reality is something intriguingly different. Alan Anderson presents three intertwined elements that educate his audience as well as keeping them rolling with laughter. The show begins as straight stand-up, with Anderson telling us all about himself, his family and his Australian adventure, which is delivered in boisterous and friendly manner. He only alludes to the drunken escapades that we are expecting, while his observations of Adelaide are more informed than most visitors’, thanks to his Australian wife. It is solid material that plays on the Scottish stereotypes as well as providing a Scot’s condescending view on the rest of the world. He endears himself to the audience as a familiar drinking buddy. The heart of the show begins when the whisky bottles are opened. It turns into a humorous lecture about the Scottish whisky industry that is far from dry and stuffy. Combining plenty of personal views with the facts, he provides information about the various distilleries and processes while inserting jokes at every opportunity. Anderson states from the outset that he is trying to dispel the stereotype of the cheap Scot by giving away booze. Throughout the performance, he dispenses samples of various whiskies to the audience but only on the condition that they earn it. This is not through embarrassing or confronting audience participation, instead just a friendly chat about their background before asking for an assessment of the sample using personally tailored criteria. During the interactions Anderson is quick on his feet with plenty of quips, a skill honed on the Scottish stand-up circuit. He has an effortless way of gently prising more information out of a punter that isn’t threatening in the least, a handy skill given the small room means almost everyone will be addressed. Most respond to his approachability by remaining after the show’s official end to chat about whisky, Scotland and other topics. ‘A highly entertaining show’ (Adelaide Fringe Review). Please note: Change of Show Title to “Alan Anderson : Whisky For Dafties”. Alan Anderson, Ha Ha Comedy and whisky comedian.com are in no way connected to John Wiley & Sons Inc, publishers of the “For Dummies” series of educational guides. 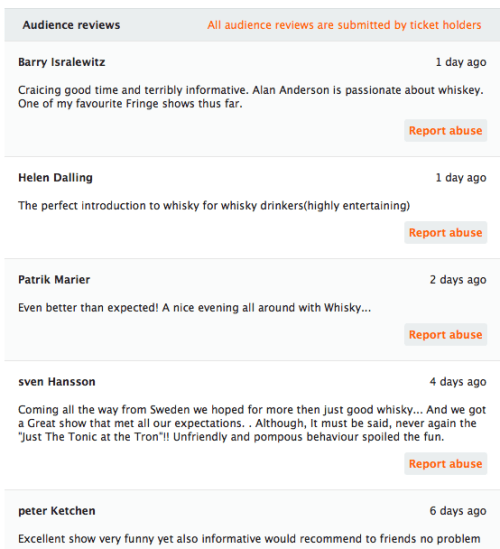 “Alan Anderson : Whisky For Dafties” and its predecessor ”Alan Anderson : Whisky Fir Dummies” are stand up comedy shows for entertainment purposes only.